Technos was founded in Japan in 1981 and made a number of popular titles in its 15 year history, with the biggest hit being Double Dragon. The Kunio-Kun series is quite well known as well; that includes Renegade, River City Ransom, and Super Dodge Ball among others. American Technos was founded in 1987 to publish localized arcade and console versions of the Japanese games to the North American market. However, not all Technos console games were published by American Technos in the U.S. as the properties were licensed to a number of other publishers. That's why you won't find Double Dragon ads in today's upload but you can find some in the Acclaim album and will see more when I get to Tradewest. In 1996 Technos filed for bankruptcy and its properties exchanged hands a few times before Arc System Works acquired the rights to Technos' catalog in 2015. 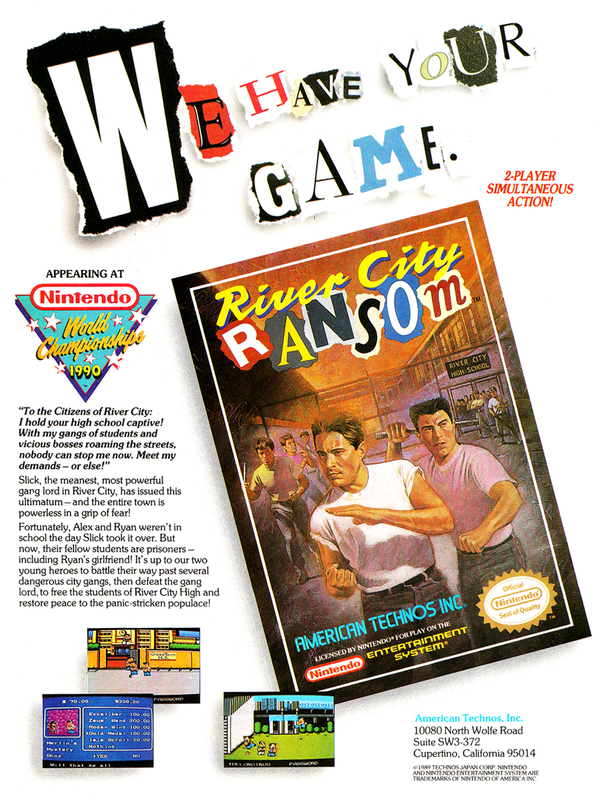 Before the acquisition took place the River City Ransom license was in use by Conatus Creative Inc. who just last month released River City Ransom: Underground for PC and Mac. River City Ransom: Underground is a sequel to the original River City Ransom, complete with retro graphics and a chiptune soundtrack.